The eagerly awaited Mountain Lion was released last week in the App Store. 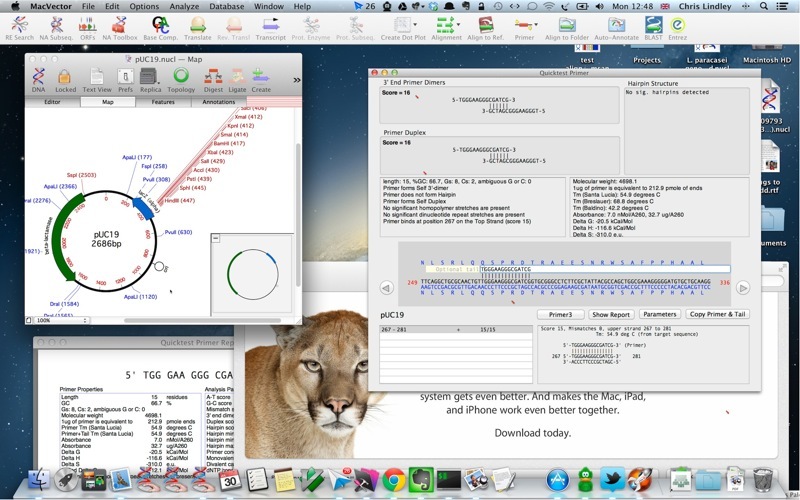 We’ve conducted initial testing with MacVector 12.6 on Mountain Lion. Our testing has found only a single fairly minor issue concerned with installation. So far there are no issues with any day to day functionality. The downloadable disk image does not automatically open with the default settings on Mountain Lion. Workaround: Open a Finder window and look in the DEVICES section of the left hand sidebar – click on the “MacVector 12.6” disc icon there to reveal the contents of the disk. We are continuing testing and this post will be updated if we find further issues (which will of course be fixed with the next update. This entry was posted in General and tagged OSX, releases. Bookmark the permalink. Both comments and trackbacks are currently closed.